You are the proud owner of a parrot and you are looking for a toy for your pet. The offer of parrot toys on the market is huge, so how do you know which parrot toy is safe for your pet? Because you should be aware that some of them are dangerous for pets as they may hurt them. Therefore, an important parrot care issue is its toys. The first aspect you should take into consideration when buying a parrot toy is the size of the toy and the size of the pet. Basically, the parrot toy should fit the size of your parrot. Why is that? Well, because a big size parrot is strong and can easily break a small toy into pieces which can be easily ingested by your pet. Therefore, try to avoid small parrot toys if your pet is big. You should know that nowadays there is a large array of big parrot toys which are made from thick plastic, perfect for a big strong-beaked parrot. Things aren't easy with small parrots wither. A small size parrot can be afraid of a big toy so try to fit the size of the toy to the one of the pet. If you can't tell which parrot toy is good for your pet, look at the label or ask for more information. Another important aspect is the type of the parrot toy. You should avoid buying parrot toys which are made out of small pieces as the parrot can remove them and, consequently digest them. Remember that a parrot has a strong beak, therefore, any piece which is bite-size for the parrot should not be on the toy. A parrot toy is usually hanging on some chains. These chains can represent a possible danger for the health or life of your pet. How is this possible? Well, chains come in two types: the chains with welded links (which are safe for your parrot) and the chains with closed links (which are not safe). The parrot may try to open up the link which is not weld and its beak would get stuck in that space. The parrot may get hurt while trying to release itself. Consequently, examine carefully the chains attached to your parrot toys. But the chains are not the only dangerous pieces of a parrot toy. Parrot toys made out of wood may also be dangerous. Therefore, wood is another important aspect to think of. Parrots are birds which love to chew wood. They do this to find bugs hidden inside the tree bark in the woods. So a parrot will always start chewing a toy made out of wood. Some types of wood are not good for parrots, so you should check the internet for a list of parrot-safe wood. Parrots are also birds which enjoy preening and grooming. Their instinct is telling them to constantly pick or even chew their feathers. This is not a healthy habit for your pet. So you should buy a chew rope, which is a very useful parrot toy as it allows your pet to exercise its habit every day without causing any problems to itself. But pay attention to the deterioration of the toy as it gets extremely ragged and worn out. Replace it with a new toy as the clumps may cause accidents to your pet. Your parrot could catch its feet into the clumps and could get hurt while struggling to escape. In conclusion, there is only one rule to apply for this parrot care issues: whenever shopping for a parrot toy use the common sense rule. If you look at a parrot toy and it doesn't seem safe, don't buy it. Don't buy any parrot toys which can get ingested or which can get a foot or a beak caught them. And always examine the parrot toys carefully before putting them into your pet's cage. And if your parrot is ignoring its new, shiny toy, don't worry. It doesn't hate it, it is just being cautious. Parrots don't like change, like most pets. And a new toy represents an unexpected change for their habitat. Therefore, the toy must be put under strict observation to make sure it is not a possible enemy. After two or three weeks of monitoring the intruder (the toy), the parrot will gain confidence into its new toy and it will start playing with it! If you have a parrot and you want to know all the parrot care secrets that you need to keep him happy and healthy then you have to join us at the parrot care information center. You will find out useful things about parrot food, parrot health, parrot breeding and best parrot toys suggestions. Boy if we had THE answer we’d be writing this from our yacht. But of course, I have to weigh in here. What got me thinking about the subject of “why birds scream,” is some recent web surfing. I spend my days doing what many of you wish you could be doing, surfing the web for bird toys and parrot cages. The magic of the internet enables us to shop the world. In order for us to provide the best possible shopping experience. We look at lots of sites and products. Pricing is important but not our priority. We feel good information about parrots and general avian issues is the most important product we can offer. And we offer that for free. We like to know who’s selling what. We also like to see how well they’re selling it i.e. is the site easy to navigate. Do they offer multiple payment choices and so forth? But I digress – So here I am on the of a national chain of pet supply products. They have an FAQ for bird ownership. Something we always applaud. Well, I’m reading the list and one of the topics is Why is my bird screaming? No real explanation is offered and at the end of the paragraph, they recommend taking your parrot to a vet if screaming persists. Yikers! Screaming parrots – vets – why? SILENCE means danger! If you’ve ever seen a hawk fly over a flock of wild birds, you swear you can hear the sound of the hawk’s wings flapping. That’s one of the reasons parrots come in so many colors. If they’re quiet and deep in a tree they are difficult to spot. When that danger passes its chirp, chirp, scream, scream. So again I ask, “is screaming a reason to run to the vet? I don’t think so. Something we hear a lot of is - people will have a screaming bird (usually newbie’s) and the bird will scream for whatever reason. What does their human companion do? Yell SHUT UP! And what does the parrot do? SCREAM SOME MORE! Excessive screaming is a learned behavior that we teach our birds. Covering your feathered companion with a blanket teaches him or her that you will cover the cage when scream gets out of hand. Yelling at a screaming parrot gives the parrot the attention it seeks. Ignoring a screaming parrot is not the answer either. Ignoring bird’s screams could result in finding injuries too late (or water had run out). Options are to make sure all your Psittacines needs are satisfied. Large hygienic cage, clean water, fresh food, working toys. Twelve hours of sleep (uninterrupted), softwood and other materials to chew, and plenty of exercises. Start with a signal to stop loud parrots. Ring a cowbell (or bang a pot) in the room next to the screaming bird. They hear the bell (sound), they stop to listen, Show up from the other room while they are quiet to praise and reward. Set them up to succeed. Use a time when you know they are quite loud. Distract them with a new noise in the next room. As soon as they stop to listen, appear and praise. Lengthen the time between the signal and your appearance each time. Try and take a whole day at first and only work with the parrot and the screaming. Initial rewards should be substantial, a known favorite treat. Use the same signal just before feeding fresh food. Wait until the parrot is noisy; give the signal, praise, and feed. Not all parrots will quiet down for the same signal so you may have to try several noises before finding the one that works for you. Note: Do not use your voice. They may try to mimic you. Scream time is a time during the day that you allow your parrots to be noisy. This should be given somewhere between 3p.m. and 7p.m. each day. Encourage your parrots by playing stimulating music. Dance, sing or scream along with them. Scream time should last no less than 15minutes and no more than 1/2 hour each day. Some parrots enjoy screaming to the vacuum, this is fine to encourage but play music as well. Find music that your parrot gets excited over. Use that same song every day for scream time. Change the music from time to time but be consistent overall. When Scream time is over, lower the music volume Talk your parrot down. Lower the music slowly, turn it off, and play their relaxation code music. Give them afternoon snacks when “cool down” is over. Birds will wait for their "Scream Time” because they know they will be rewarded for their patience. Good toys have different shapes and textures for the bird to explore and destroy. At least three toys should make a bird work for food Working toys are toys that make them work for their treats or favored foods. Parrots in the wild will spend the majority of their waking hours, hunting and foraging. Toys stimulate their mind and help replicate actions they would execute in the wild. Proper toys and placement enhance a Psittacines life in captivity. Three or four toys should be made of softwood. Softwood allows you to push your fingernail in forming an indent. Introduce pieces of food like broccoli or corn, using one of many commercially available or homemade toy holders. The food on the toy holder rewards them for playing. The more textures, shapes, sizes, and colors the better. Diversity is important because in the wild your birds eat a diverse diet. An eclectic selection of toys helps maintain your feathered companions interest. The majority of toys should hang or be placed in the upper third of the cage. Introduce a few more to the middle third (without hampering access to food dishes) around a perch made from softwood, comfortable to grasp depending on the size of the bird’s feet. The bottom third of the cage should remain relatively uncluttered to allow the bird to walk freely. This article is for you if you own a parrot or are thinking about getting a parrot. You already know that you need a LOT of toys to keep a parrot entertained if you have a parrot or several parrots. If you're thinking about getting a parrot then get ready to hire a staff of Santa's Elves because you're going to need them. Most parrots love to destroy toys. This is a healthy, necessary, and required behavior. After food, water, and your attention, toys are probably the next most important things in your parrot's world. 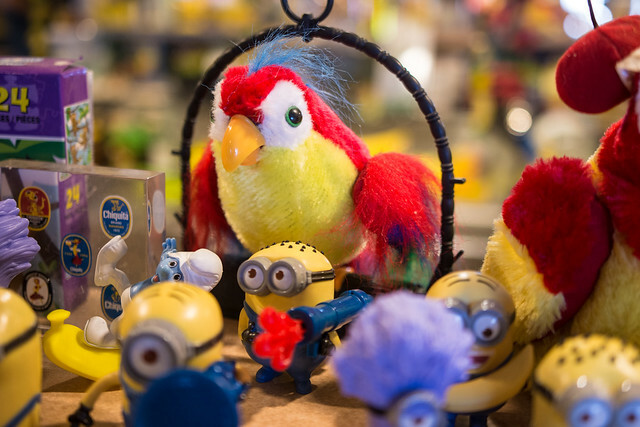 Toys are not an optional accessory for you parrot; they are essential. Toys provide mental stimulation, physical stimulation, and keep your parrot's beak trimmed. Parrots spend a lot of time searching and foraging for food in the wild. This entertains them and stimulates them. In your home, the toys provide the necessary means for your parrot to entertain itself. Toys also provide the mental stimulation required by your parrot. Some experts say that the parrot's emotional level is similar to a 2 year-old child. They also say their intelligence is similar to a 3 year-old child. So stimulating toys are just as necessary for you parrot as they are for a 2 or 3 year old child. There is also another more tangible reason for providing toys for your parrot. Toys are required to keep your parrot's beak trim. The beak is always growing much like out fingernails. Your parrot's beak will become overgrown without something to chew on. This will require a trip to the vet, toweling, and filing of the beak. This is stressful to the parrot and can be avoided by providing toys for your parrot to chew up and destroy. 2 - What Are the Types of Toys? There are several types of toys. These are general categories and some toys fall into several of the categories. Some are designed to give your parrot mental exercise such as Puzzle Toys. Some are designed to give your parrot physical exercise such as Exercise Toys, and Grasping Toys. Finally, some are designed to give your parrot a healthy beak and healthy feathers such as Chew Toys and Preening Toys. Puzzle Toys - These are typically puzzles with treats inside them. They encourage the parrot to solve the puzzle to earn the treat. Some are simple lids on boxes and some are complex and require the parrot to unscrew nuts from bolts to open a treat holder. Exercise Toys - These are typically rings or ladders that encourage your parrot to climb, hang, or swing. Grasping Toys - These are "hand" held toys and other toys that encourage your parrot to hold them while playing with them. This encourages your parrot to exercise its "hands". Chew Toys - These are for shredding. They keep your parrot's beak trim. 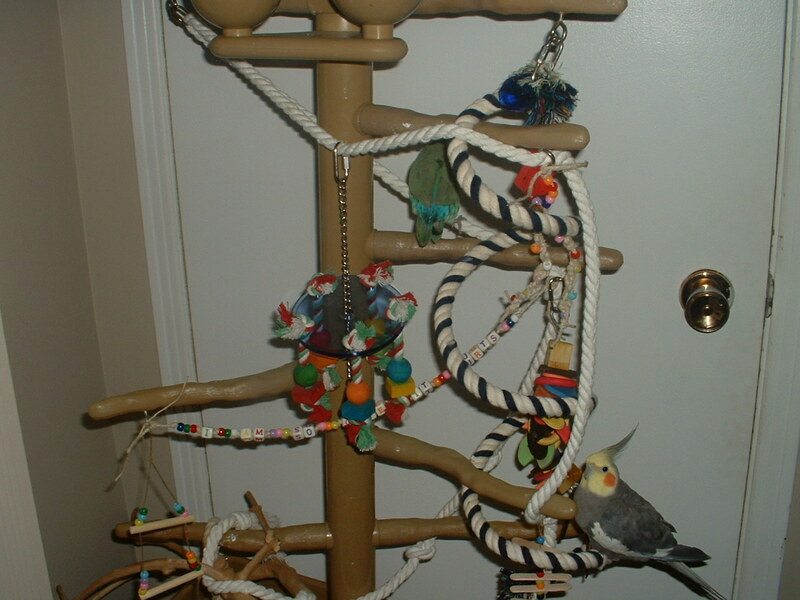 Preening Toys - These are typically hanging toys that encourage your parrot to preen them. The theory is that if your bird preens it's toys then it will be encouraged to preen itself. Preening is necessary for your parrot to maintain healthy feathers. There are several things to avoid when buying or making toys. These include safety issues with your parrot consuming the toy and other physical safety concerns. Some materials to avoid include toxic inks, staples, rubber, Styrofoam, soft plastic and costume jewelry. These items are potential dangerous items if your parrot ingests them. There are also items that pose a physical danger. These items include key-chain rings, frayed ropes, and a crowded cage. Key chain rings can potentially get caught on you parrot's beak or their nails. Frayed ropes are also potentially dangerous if your parrot's feet get tangled in the frayed ends. Finally, a crowded cage can be dangerous if your parrot doesn't have room to spread its wings. Leather strips are often used to tie toy parts together. If you're using your own leather strips then make sure they are not dyed, tanned, or treated in any way. If there is a doubt then don't use it. Glue is often used to glue toy parts together such as Popsicle sticks. Make sure you use a non-toxic glue such as Kid-Safe glues if you use glue and use as little as possible. Glues should be avoided when making toys unless necessary. A "Kid-Safe" glue that is non-toxic should be used if required and you should use as little as possible. One final consideration regarding safety is toys mixed with food or treats. Some toys have treats in them or fastened to them. This is acceptable and this type of toys is one of the parrot's favorite toys. However, flavoring toys with food can be dangerous and should be avoided. This happens when some people make toys and want to color the toys. The coloring should be non-toxic and food free. If it tastes like food or a treat then your parrot may consume it. If you want to dye wood blocks then use a nonflavored coloring for the same reason. Some people recommend food coloring or unsweetened Kool-Aid to color your wood blocks. 4 - What Makes a Toy a Good Toy? There are several factors that make a toy a "Good Toy". The most important factor is that the toy must be safe. The previous section listed some materials to avoid. This section lists some characteristics that make a toy a "Good Toy". Colorful - Parrots can see colors. Chewable - This will help keep their beak trim. Different Textures - Parrots "feel" with their beaks and can distinguish different textures. Appropriate Size - Buying or making your toys the appropriate size is a key consideration. Mentally Challenging - The toys should be mentally challenging such as Treats inside Toys. Quick Links - Also called "C clips" or "C clamps". They have a screw fastener and are shaped like a "C"
Moving Parts - Parrots love a lot of moving part and swinging parts. Makes Noise - Parrots love bells and musical toys. Puzzles - Some "puzzles" are simple (lid on a box) and some are very complex. 5 - Where Can I Get Toys? Now we know what makes a dangerous toy and what makes a good toy. There are a few places/means to get toys. You can purchase them at pet stores or on the Internet. This is the easiest and most convenient way to get toys. You can also build your own toys. These are referred to as DIY (Do-It-Yourself) toys. This is the cheapest way to get toys. Finally, you can do a combination of buying, building, and recycling which for most people is a happy medium. Buying toys at pet stores or online is very convenient. There are two key considerations necessary before buying the toys. These are material and size. Toys come in a variety of materials and are often a mix of the following materials. The common toy materials are wood, rope, leather, acrylic, and metal. All of these materials are safe. However, you should check each toy to ensure that there aren't other hazards such as entanglement (frayed rope or clips) or ingesting hazards (small parts). The size of the toy is also a key consideration. Most pet stores recommend what toys should be purchased for what size of parrots. However, there isn't an industry standard in "sizing". Check the size of the toy and match the size of the toy with the size of your parrot. A general sizing is small (Conures & Pionus) , medium (African Greys & Amazons), and large (Macaws & Large Cockatoos). Buying toys is often how parrot owners start out getting toys for their parrots. After buying parrot toys for a while you will soon realize that the cost is very high. You will find yourself spending $10 for a toy with nothing to show after a couple hours of your parrot chewing on it. It's very similar to feeding money into a shredder. Some parrots are better at destroying toys than others so some parrots require a lot more toys than others require. You will soon begin to realize that you can build your own toys a lot cheaper than you can buy them. Building your own toys is the cheapest way to get toys for your parrot. DIY (Do-It-Yourself) toys are a cost effective means to provide your parrot with toys. This does require some knowledge and experience using tools but only very basic tools. You might need a wood saw to cut wood, a drill to drill holes, and possibly a pair of pliers. You can purchase the wood at a local hardware store, bring it home and cut it up, then hang it from your bird's cage using rope, wire, cloth, or leather strips. The DIY method also requires some creativity on your part. However, after looking at other toys at pet stores or online, you can come up with your own ideas about building your own toys. While this is the cheapest way to get toys, it does require a lot of cutting and drilling. There is a third option for those of you who don't have the energy or inclination to dedicate this much effort. This option is a combination of buying toys and making toys. The third option for getting toys is to combine the buying and making methods. In this case you purchase toy parts and make your own toys. These toy parts come in toy making kits where all the pieces are included and you just have to assemble them. These toy parts also come in packages that just include wood blocks or just include plastic blocks, or just include other parts. In this case, you may want to purchase several different packages of toy parts and mix and match them. This requires very little work because the toy parts are ready to assemble and don't require cutting or drilling. And these DIY kits are often cheaper than the fully assembled toys. This option is how most long time parrot owners get toys for their parrots. 6 - How Can I Save Money on Toys? There are several ways to save money on toys. The first option is to use common household materials to make toys and to supplement toys. Here's the "Top Ten Cheap Materials to Use to Make Parrot Toys" It actually has sixteen items but who has ever heard of the "Top Sixteen List"? Unscented Toilet Paper rolls and Paper Towel rolls - Most parrots love to shred these. You can put them with other toys or just hang them from their cage. Some recommend that you not use these items due to the glue on the rolls containing Zinc. You may want to watch your parrot the first time to see if they're eating them or just shredding them before turning them loose to shred these. Chinese Finger-Cuffs - That may not be the politically correct name for these. They're the tubes that you put your fingers in and they tighten as you pull your fingers out. These can liven up any toy or be used alone and hung from the cage bars..
Magazine Inserts - You know those annoying things ads that fall out of magazines? Guess what your parrot thinks of them. They love to shred them. Some warn against giving these if they have ink on them but just watch your parrot the first time to see if they're eating them or just shredding them before turning them loose to shred these. Baby Key Rings - Baby toys usually make an excellent toy for parrots too. The baby key rings are a lot of fun and provide long lasting entertainment to your parrot. Paper Cups, Plates, Straws - All of these are inexpensive and easy to chew for your parrots. Cut them and tie them together. The more creative you are, the more your parrot will appreciate them. Ping Pong Balls - These provide good "hand" toys or if you poke a hole through them you can hang them in their cage or on their play-stand. Pine Cones - If you have these available, they make a great toy. Make sure they're clean before giving them to your parrot. Newspapers - Just make sure the ink isn't toxic. Roll the paper up into a tight roll and tie it together. A paper-log can provide hours of fun to your parrot or just minutes depending on what type of parrot you have. Cardboard boxes - Small boxes can provide fun to your parrot and you as you watch your parrot experiment. Ink Pens - Those plastic pins with the clicker button make an excellent toy. Just make sure you remove the ink part and the inside parts (clicker,spring,etc) before giving it to your parrot. BONUS!--Wooden Clothes Pins - If you have any, these are great chew toys for parrots. Just make sure they're the old style without the metal springs. BONUS!--Worn Shoe String - Make sure they're clean and use them to tie other toy parts together. Watch for frayed ends, which may get tangled in the parrots talons. BONUS!--Rag Strips - Cut old (clean) rags up and tie them in knots. Just make sure they're clean and watch for frayed ends, which may get tangled in the parrots talons. BONUS!--Unscented Paper Towels - Just tie them around their cage bars or around toys and watch them shred these. This is also a good way to encourage a parrot to play with a new toy. BONUS!--Coffee Filters - Just the plain cheap paper filters. Cut a hole through a bunch of them and tie them together with string or a leather strip. This is cheap and will provide a lot of entertainment. BONUS!--Food Stuff - Some people use Cheerios and raw pasta to supplement their toys. They tie the Cheerios or raw pasta onto toys or just hang strings of them from the cage. I personally don't like to mix food and toys but it's just a personal preference. BONUS!--Popsicle sticks - You can buy these at craft store at reasonable prices. If you use them after eating the Popsicle then rinse it thoroughly. The second way to save money is to reuse and recycle old toys. It is important to regularly clean and rotate in new toys to keep your parrot healthy and stimulated. This is the perfect opportunity to clean and disassemble old toys and use the old parts with new parts to make new toys. This recycling saves money and also provides some familiarity to your bird when you rotate in new toys. This familiarity will encourage your bird to play with the new toys. Getting your parrot to play with new toys is sometimes a challenge. This topic is covered in the next section. The third way to save money is to go to "Second Hand" stores such as "Goodwill" and "Salvation Army" stores. They probably don't have bird toys but they do often have baby toys. Most baby toys are also safe for parrots. Be sure to heed the safety warnings earlier in this article. Most toys like wooden blocks use toxic free paints that make them usable by parrots. Also some of the toys such as the hard plastic baby key rings make excellent toys for parrots. There are excellent values to be found in these stores and these stores provide another way for you to save money on your parrot's toys. 7 - How to Get Your Parrot to Play With Toys? So either you spent $20 on a new toy or you spent 20 minutes making a new toy and you show it to your bird. Your anticipation and excitement level is about 10 on a scale from 1 to 10 but your bird's excitement level is about a 1 on a scale from 1 to 10. What happened and how can you fix this problem? Some parrots are afraid of new things, some are afraid of certain colors, or just afraid of the way some objects look. These fears or your parrot's shyness can challenge you and your parrot. Here are some ideas to overcome these fears and to encourage your parrot to play with toys. Put a dab of peanut butter on it but make sure you wash it off later. The first idea, "Introduce new toys slowly", will vary depending on your parrot. Use the following process for very shy or frightful parrots. Start with the new toy several feet from the cage but within sight of the bird. Put the toy in the bottom of the cage for a couple days. When your parrot plays with it then hang it in the cage. If you notice fear in your parrot at any point in the process then you should back up a step in the process and proceed slower. There are thousands of possible DIY toys that you can make your parrot. Here are ten ideas that require no tools and very little time. Wrap a treat in a paper towel and tie both ends. Use a clean cloth glove as a piata. Take a piece of paper towel roll and put a treat inside it and crimp both ends. Tie Paper Towels onto a string with wood blocks and hang it. Poke holes into nuts and make a string of nuts and wood blocks. Roll up a newspaper into a tight log, tie it in the middle, and hang it. Poke holes into a stack of Magazine Inserts, thread them on a string with wooden blocks and hang it. Glue Popsicle sticks together and hang it. Put a Ping Pong ball inside a closed paper cub and hang it. Any combination or mix of the 9 ideas above. Hopefully this article has been a useful introduction to toys for your parrot. The topics in this article will help you save money, help you make entertaining toys, and help you provide your parrot with the stimulation and entertainment that it requires. The Internet is a good source for ideas. Check out the commercial toys for sale on the Internet and try to duplicate them. Have fun, be creative, and save some money.